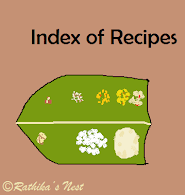 In Tamil homes, mixed rice preparations are specially made on the 18th day Aadi, 4th month of the Tamil calendar (ஆடிப்பெருக்கு (அ) பதினெட்டாம் பெருக்கு). This marks the celebration of fresh water flowing into the rivers owing to monsoon. During my childhood, we used to go to the riverbank, pray and eat the mixed rice preparations or 'chithrannam' (சித்ரான்னம்) made at home. Children would play on the riverbank, while adults will sit and enjoy the leisure. Heavy currents of the river used to be a wonderful sight. Today happens to be 18th of Aadi. Hence, I thought it would be appropriate to post some mixed rice preparations today! Tamarind rice (புளியோதரை) is very popular mixed rice preparation in Brahmin cuisine, especially ‘Iyengar puliyodarai’ (ஐய்யங்கார் புளியோதரை) is very famous. Tamarind rice is generally prepared while undertaking long journey as it does not get spoiled for several days. Even today, after traditional Brahmin weddings, the bride is sent with the groom’s family with packed food called ‘kaatu satha koodai’(கட்டு சாதக்கூடை) which invariably contains tamarind rice. Let us see how to make ‘Iyengar puliyotharai’. *Alternatively you may use whole Bengal gram instead or ground nuts. Soak 1 small hollow ladle of (50ml) whole Bengal gram (கொண்டை கடலை) overnight and pressure cook for 5 minutes. Roast sesame seeds and when they turn light brown in color and transfer to a bowl. Heat a teaspoon of gingelly oil in a kadai, add coriander seeds and methi seeds. Sauté till methi seeds turn darker. Add asafoetida and switch off the stove. Transfer to a bowl and allow it to cool. Once cool to room temperature, powder the fried ingredients finely. Roast ground nuts on high flame till they become darker. Cool to room temperature and remove the skin. Keep aside. Heat the remaining oil in the kadai, fry red chillies till they become dark. Add urad dhal and Bengal gram dhal. Fry till the dhals become dark brown (கருக வறுக்கவும்) in color. Add tamarind juice and bring it to boil. Once the raw smell of tamarind disappears, add the prepared powder, turmeric powder, ground nuts, curry leaves, remaining oil and salt. Cook on a low flame till the paste thickens and oil separates. Switch off the fire and allow it to cool. Store in a clean jar! Add half the quantity of the tamarind rice paste or ‘pulikachal’ to the cooked rice and mix well. You may add more paste if you like the tamarind rice to be spicy. Serve with appalam or vadam. How to store: You may store tamarind rice paste or ‘pulikachal’ in a clean, dry airtight glass bottle and use it when required. Always use a dry spoon to handle paste. DO NOT leave a stainless spoon in the bottle permanently. If stored and handled properly ‘pulikachal’ remains fresh for at least a month.